Our team made it to the finals and despite putting in a great effort, we lost 5-3. Disappointing? Yes. Although, we still had lots of fun and once again, some of us went to eat afterwards. That is a win in itself! But where? We decided to do something a bit different. How different? How about a Japanese restaurant on the ground level of an apartment complex. You might be wondering whats so special about a Japanese restaurant on the ground floor of an apartment building. What if I told you it was predominantly senior housing? Still not convinced? Alright, how about a Japanese restaurant that looks more like a cafeteria from th e 1970's and serves up traditional food such as sushi, donburis, tempura and lasagna. Wait a minute, Lasagna??? Yah, the restaurant of choice was Tenhachi. Think of it as very similar to Hi Genki, but not. I think it's in a category all by itself. Joining me for dinner was Milhouse, Mr. Blueberry, Gadget Girl, Boss Woman and Kim. Kim? Again? Yah, I think we made him an honorary member of our team. Maybe he can be the waterboy next time we play... LOL... Once again, much like at King Sushi, we separated into the sharers and the non-sharers. Well, it was only Kim, Milhouse and I sharing... We started with the Wakame Salad and honestly, I haven't had many that were bad. 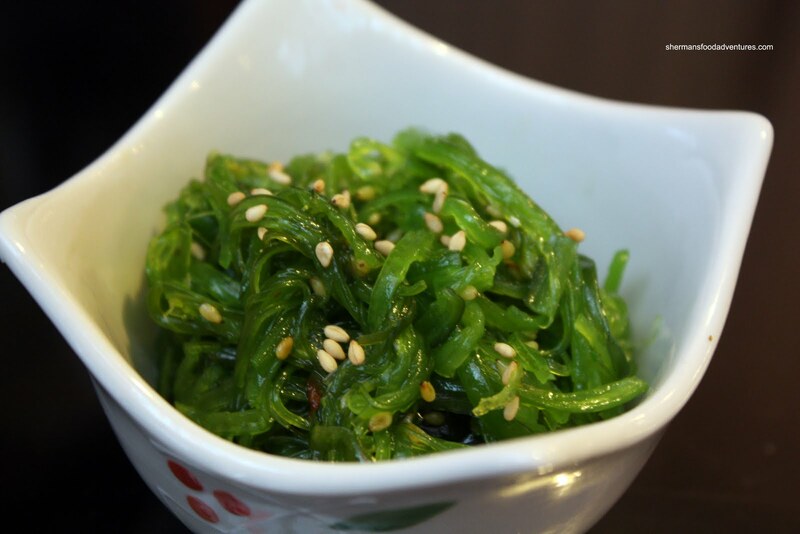 Essentially, it's just seaweed with soy, sesame oil and rice wine vinegar. It's pretty hard to screw up; but then again, I'm sure I'll run into that eventually. This one was well balanced and had that "snap" chewiness we look for in wakame. We also got an order of the Red Tuna Sashimi and it was served with dark soy. We tried the tuna with both types of soy and figured that the dark soy (being less salty) allowed the tuna flavour to come through. Kim thoug ht the fish was a bit disappointing in terms of texture and taste. I have to agree with him there. The tuna was on the softer side and didn't exhibit much flavour at all. 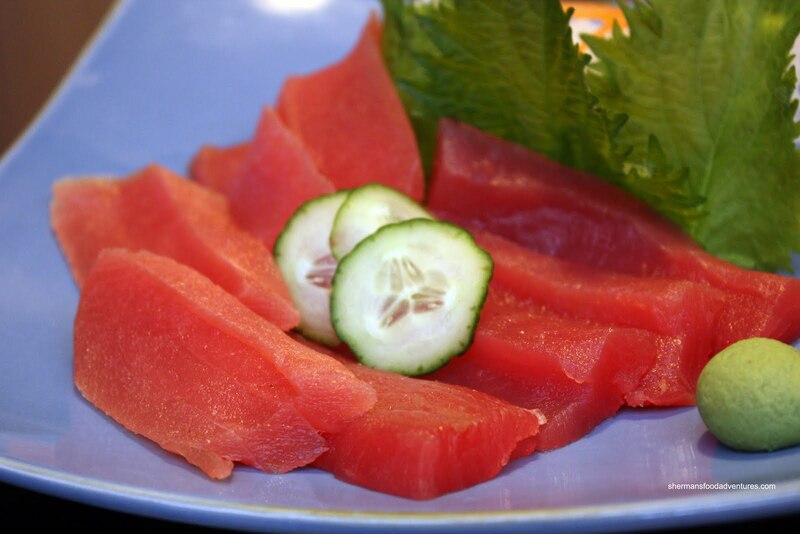 I've had better red tuna sashimi, namely Tokachi. 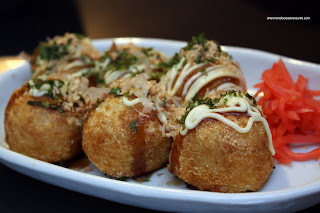 Seeing that there was Takoyaki on the menu, I went ahead and ordered it as usual. What can I say, I like octopus balls! Uh... well, it's actually more like a small slice of tako in a fried flour ball. Initially, that scared Milhouse until we explained it to him. These were not bad, maybe a tad on the stiffer side and definitely in need of more bonito fl akes (and possibly more sauce). Kim thought we should go a different route for tempura and ordered the Mushroom Tempura. 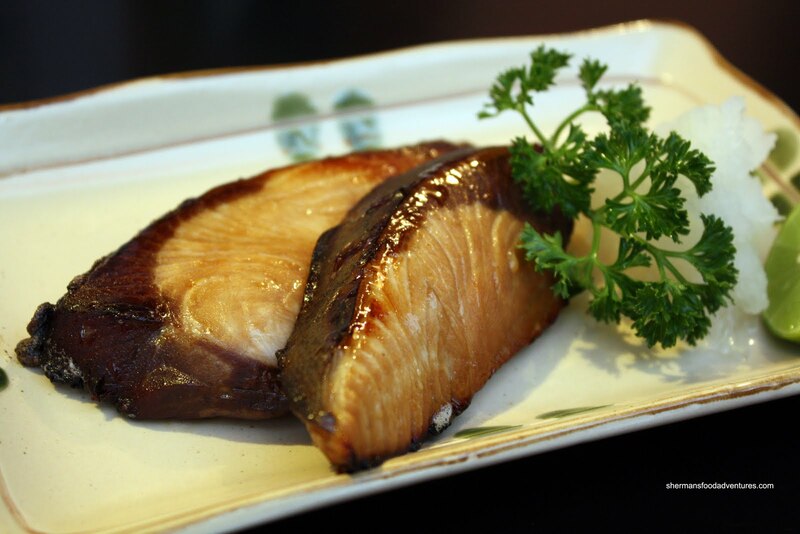 Consisting of shiitake, masutake and shimeji, this was definitely different. I thought that the batter could've been more crisp; otherwise, it was pleasant to eat. I personally love mushrooms and especially these ones since they have quite a nice meatiness to them. Served on the side was tempura dipping sauce with grated daikon and ginger. To satisfy our sushi roll requirement, we went for the Mang o Roll. At only $4.95, this was a pretty good value considering that there were 8 fairly large pieces. 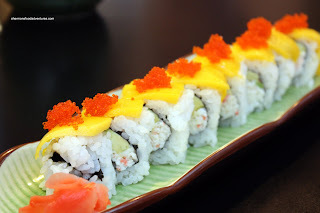 As Kim remarked, the mango was ripe and sweet; thus we could really call this a mango roll. Too many times, the mango used is not ripe and it becomes an afterthought. The sushi rice was not bad, not as firm as I would've liked it; but solid nonetheless. We also picked a random cooked fish as well deciding on the Hamachi (yellowtail). Even when raw, hamachi is quite meaty and firm. Thus, cooked, you can only imagine it being even more meaty and firm. This was definitely the case here and honestly, I'm n ot a big fan. Nothing to do with the execution of this dish in particular. Now for something really traditionally Japanese! Lasagna! WTH??? Yah, there are a few items on the menu that seem to exist for the buildings clientele. Kim thought it would be a great idea to try and viola, we ordered lasagna. Yes, the Caesar salad was generic and the garlic toast was exactly white bread with garlic spread. However, you know what? The lasagna was pretty decent! Definitely homemade with plenty of beef, ricotta and mozzarella, this lasagna had body. A little on the bland side with the tomato sauce tasting quite sweet rather than tart, I wouldn't mind eating it again. And that pretty sums it up. Tenhachi is a homey restaurant. From it's 70's decor to the friendly staff with name tags the size of flash cards, this place is tacky. However, that is where Tenhachi gets its charm. Not conforming to modern restaurant standards, you really can get a home-style Japanese meal here, even if it is lasagna or a Salisbury steak. Once again, thanks for inviting me! I think it our total bill was a bit high because we were ordering random dishes to share but, if we stick with some of the meal sets, it might be quite affordable. For example, the oyakodon/katsudon ordered by... ??? (as usual, I don't remember all your hockey team member names!) was a steal for under $10! I agree, the individual dishes can be of good value too. The more "specialized" items did cost more and probably rightfully so. You can join us for eats anytime! I'm not sure why Holly's post got deleted/didn't post, but she essentially said there are parking spots at the back. Thanks! 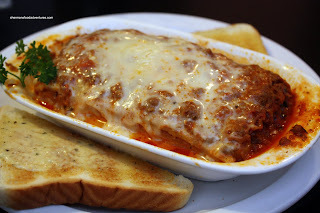 I was shocked to see a lasagne pic on this post!!! Glad that it was pretty decent though. I think your program doesn't like me. It's happened to a couple of recent postings. Waterboy.....rofl. I can't imagine it. good find! reminds me of a sushi place here in abby i went to. it's close to the university and after we sat down, i couldn't figure out why fish and chips was on the menu. turns out the place shares space with a fish and chips shop. i immediately thought the food would be awful but it was actually decent - by abby's standards! mushroom tempura... nice! 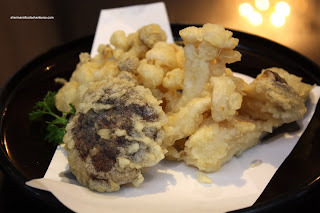 i love mushrooms and have never seen it in tempura form. the mango roll looks good too... guess we can't always judge a restaurant by its location? The dishes in your photos look delicious and well presented than those taken a couple years ago in Urbanspoon. New management? 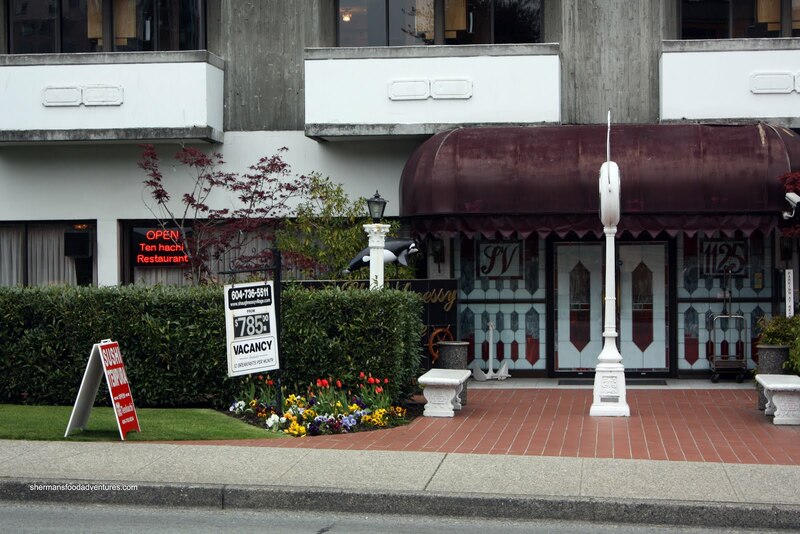 A plus point, it's within walking distance from VGH. Any thoughts on adding Kim as a playing member of your hockey team next year? He might make a good goalie. LOL. He should give it a try!